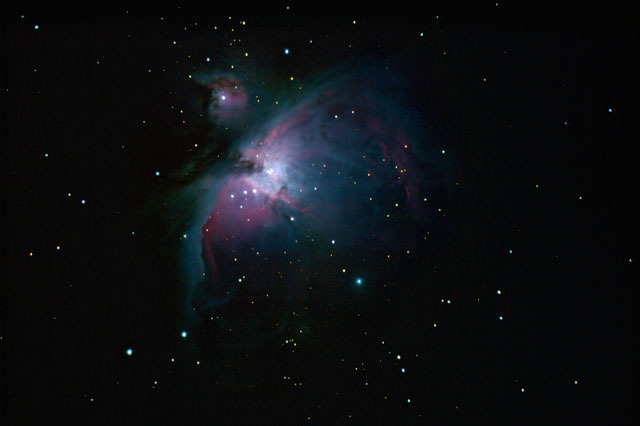 M42, commonly called the Orion Nebula, is a fascinating region of star formation. In this image, most of the stars are brand new "baby" stars, typically on the order of ten to a few hundred thousand years old. Astronomers have identified around 700 stars that are formed from this nebula. In this photo, you can easily see the "Trapezium" - the bright asterism of 4 stars in the center of the nebula. The red areas in the nebula are mostly shining from hot hydrogen gas in the nebula. The blue areas are mostly dust that reflects the light of the hot blue stars. 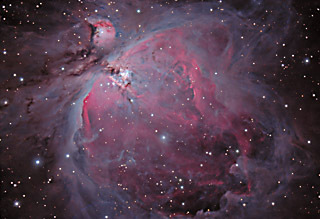 One of these areas is at the top of the image - the circular nebula above the main nebula is actually M43. Software Used Maxim DL for camera control, Images Plus 4.0 for calibration, stacking and digital development. Photoshop CS5 used for flat fielding, shadows and highlights, levels, saturation adjustments, unsharp Mask, screen mask invert. Noise Ninja used for noise reduction. Notes This is the first decent astrophoto I took using a digital camera (I had used film cameras for astrophotography for many years). Although this image leaves a great deal to be desired, it is dramatically better than anything I was ever able to capture with film.